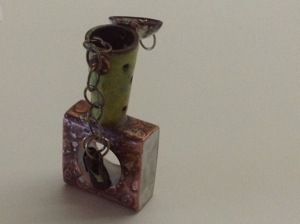 concrete and enameled copper jewelry… woo hoo! a few new designs …. both with etched copper, cold connections, small hinges and concrete. 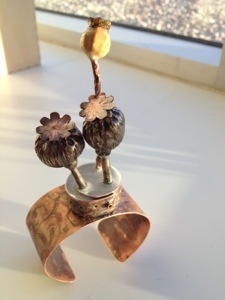 although i call them “wearable art”….. i’m proud that they are really small sculptures. 2 of the poppy plants were cast from wax with the middle knuckle for the hinge made from wax. with a little coaxing, they eventually fit with the copper fabricated topper. next project……. brooch designs and finishing up some jewelry for the upcoming open studio shows! Next PostNext open purple studio dates….